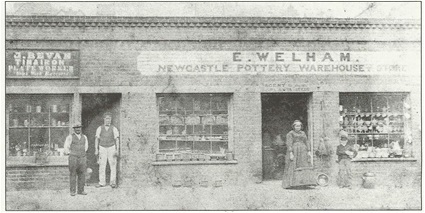 Welham Family - Newcastle, NSW. Welcome to the Welham family website. I'm Jenny Richardson (nee Welham), a direct descendant of Nathan John Welham, whose parents Samuel and Eliza (nee Goodwin) emigrated to Australia with their children aboard the Bussorah merchant ship from Bristol England, to Port Jackson (Sydney) NSW, in 1841. For the past 20 years I have gathered up information on the Welham family and just recently it occured to me that it would be a good idea to share the information with other Welham descendants on a web page and hopefully others will come forward with further information and photographs. Many thanks to Shirley Brierley of Sydney for giving my parents a hand written Welham family tree about 30 years ago and making me curious, and to my cousin Joy Manson (nee Welham) for sharing information and photographs over the years. Thanks also to Naomi Kalogiros (descendant of Jane Eliza Welham) and Jason Smith and Lee Eggleston( both descendants of Mary Ann Orphan Welham) for supplying information and photographs. Alan Hughes of England, a descendant of Samuel's youngest brother Benjamin, has also been very helpful with information. Amanda Miller and Pamela Coll (descendants of Nathan Welham's daughter Annie) have been very generous to share photographs and information. I apologize for any inaccuracies, and welcome corrections. NB: This is a work in progress! Memorial Plaque for Nathan Welham at Jacksons Bay, Westland, South Island New Zealand. My brother Murray Welham and I travelled to Jacksons Bay and placed the bronze plaque on a large rock on the foreshore in the vicinity where Nathan was buried in 1875, on the foreshore in an unmarked grave. For further information, scroll down Nathan John's page.